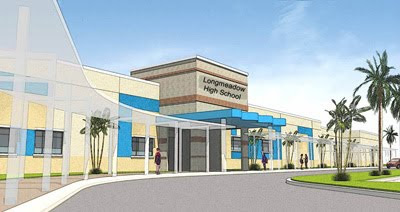 The Longmeadow School Building Committee (SBC) has been working hard developing a plan to renovate or build a new high school. A number of factors, taken together, will determine whether the SBC selects an addition/ renovation or a completely new school as the long term building solution. The current project timetable shows a presentation to the Massachusetts School Building Authority (MSBA) (November 2009), final MSBA project approval (March 2010), a debt exclusion vote at the annual town meeting (April 2010) and if successful, a followup vote at town elections (June 2010). Longmeadow will get only one chance through this process so it's important to get it right the first time. A first public forum to discuss the status of this work was held on August 18. A web video of this event and the accompanying slide presentations are available on the SBC website. Most recently, the SBC posted a series of FAQs on its website that should be of interest to most town residents. The SBC is charged with developing two options for the MSBA and then the MSBA makes the final decision. On November 18 there is a scheduled meeting between the SBC and the MSBA to review Longmeadow's proposals. **It is important to understand that the town will not be able to vote on new vs. renovation nor will the town be able to vote on multiple options. There is only one vote- by the SBC. On Wednesday, September 16 at Glenbrook Middle School at 7 PM there will be a second (and last) public review session conducted by the SBC for feedback and discussion. The architects will be presenting several building options for the long term building solution for LHS. The purpose of the public forums is to present the options to town residents and solicit feedback. Community input is essential in order for the SBC to make informed decisions. The forums are designed for residents to come and speak up and ask questions. The School Building Committee will be voting on the final recommendation on September 30. This school building project is one of the most important issues facing our the town in recent years. Take the time to come to this last public forum on September 16.... listen, ask questions and provide feedback to the SBC. Visit the School Building Committee's website often to keep abreast of new developments. or simply shared by commenting to this post.